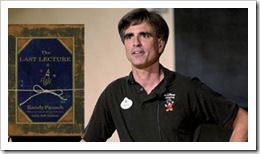 Randy Pausch the author of The Last Lecture, died on July 25th, 2008. If you have never watched the last lecture or read the book I highly recommend that you do. The lessons Randy teaches are life changing. His story is simply inspiring and amazing. The video of his lecture online has had over 15 million views to date. In his book he talks about apologies and the lesson that he would teach his students on how to make them. As long as we are alive on this earth we will make mistakes and hurt others feelings, it is just a fact of life. Randy’s lesson is one that has helped me to become a better apologizer, which in turn has made my life better. Since we are always going to need to make apologies I thought I would share what Randy wrote about making them with you today. Apologies are not pass/fail. I always told my students: When giving an apology, any performance lower than an “A” really doesn’t cut it. Half-hearted or insincere apologies are often worse than not apologizing at all because the recipients find them insulting. If you’ve done something wrong in your dealing with another person, it’s as if there’s an infection in your relationship. A good apology is like an antibiotic; a bad apology is like rubbing salt in the wound. 1. What I did was wrong. 2. I feel badly that I hurt you. 3. How do I make it better? Randy goes on to tell that we must be patient when we have hurt someone and then apologize as they(the person we have offended) may not be in the same emotional place as we are because of hurt feelings . His advice is to be patient and our patience will be both appreciated and rewarded. Such sound advice from such a brilliant man. Below is a link to the actual video of the last lecture, it is well worth watching when you have the time and then read the book, it is one that will change how you look at many things. This entry was posted on Monday, March 16th, 2015 at 8:00 am by Tina Del Buono, PMAC. Filed under Communication, Happiness, Leadership, Manager Topics, Motivational, Self-improvement. You can follow any responses to this entry through the RSS 2.0 feed. Both comments and pings are currently closed.